Cone 10 reduction. 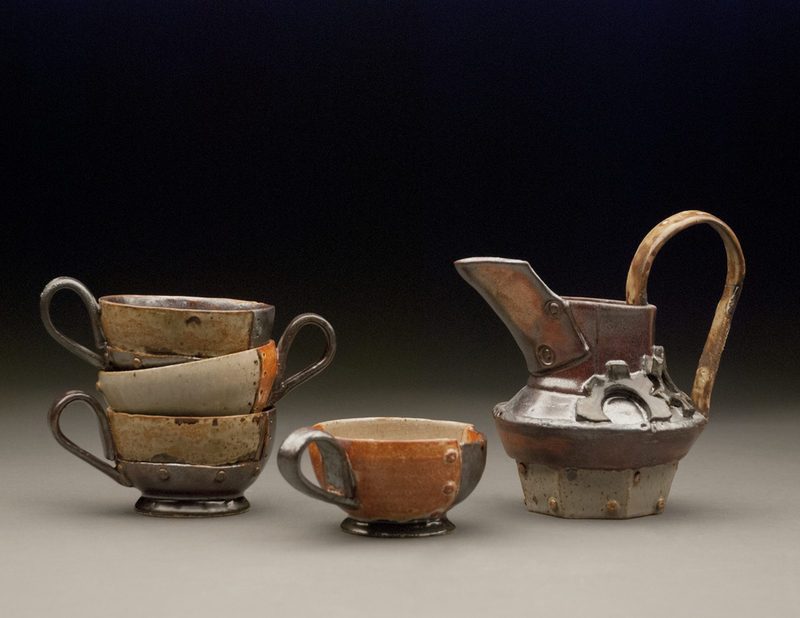 Wheel thrown grey stoneware with shino glaze and colored slips. First introduction to design considerations of liquid-containing vessels. Demos and expectations of the student to consider ergonomics, design, foot, rim, and handle design/placement. Cone 10 reduction. Wheel thrown grey stoneware with yellow salt and dark green celadon glaze. Students choose to make either a bottle or pitcher form. Pouring vessel must connect to cups in form, concept and/or surface. 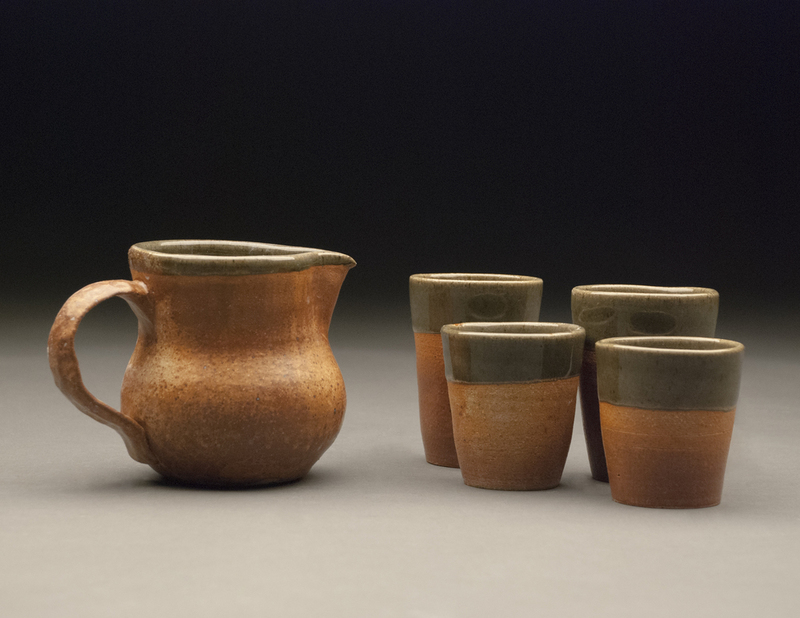 Set must be designed with specific beverage in mind, which is served to peers during critique. Cone 10 reduction. Wheel thrown, altered and assembled grey stoneware with shino, temoku glaze and slip. Cone 10 reduction. Wheel thrown altered and assembled grey stoneware with shino, glossy black and liner white glaze. Cone 04 reduction. Sprig mold assembled and altered red earthenware with Bart’s Bronze glaze. Cone 10 reduction. Sprig mold assembled and altered grey stoneware with manganese wash and clear glaze. Two classes are spent with students on anatomy slide lectures and charcoal still life drawings from an example skull. Students are then sent home with the assignment of researching skull specimens, and t.o bring research photos from medical textbooks, museums, etc to class. Students are given a solid mound of clay and tasked with building a replica of their chosen skull, replicating scale, form, detail, etc. After firing, students were given allowance to finish or treat the surface in whatever material they chose. 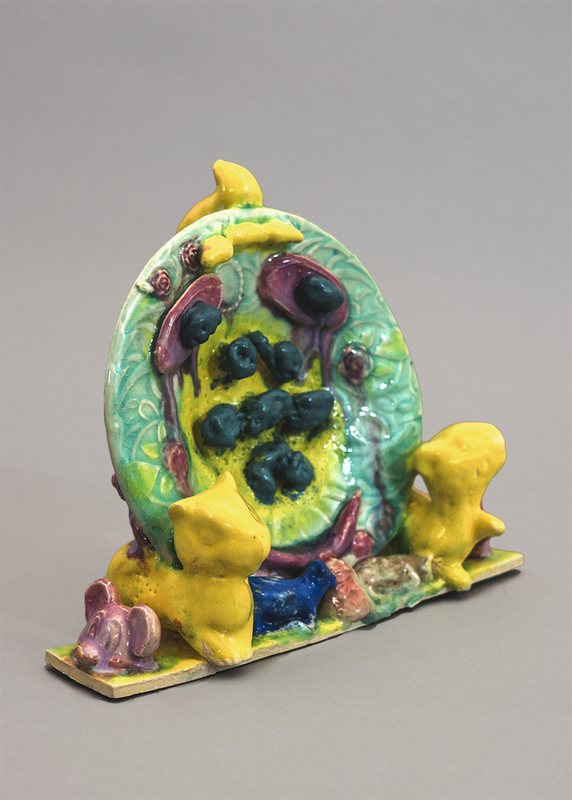 This particular example is from a freshman foundations student enrolled in 3D Design who had not previously worked with ceramics. Cone 10 reduction. Coil built and altered grey stoneware with temoku and turquoise glaze. Students are tasked with creating a coil built sculpture, while responding to in-class discussions about the meaning of ‘Body’, both as an object moving through --and occupying-- space. Cone 04 oxidation. 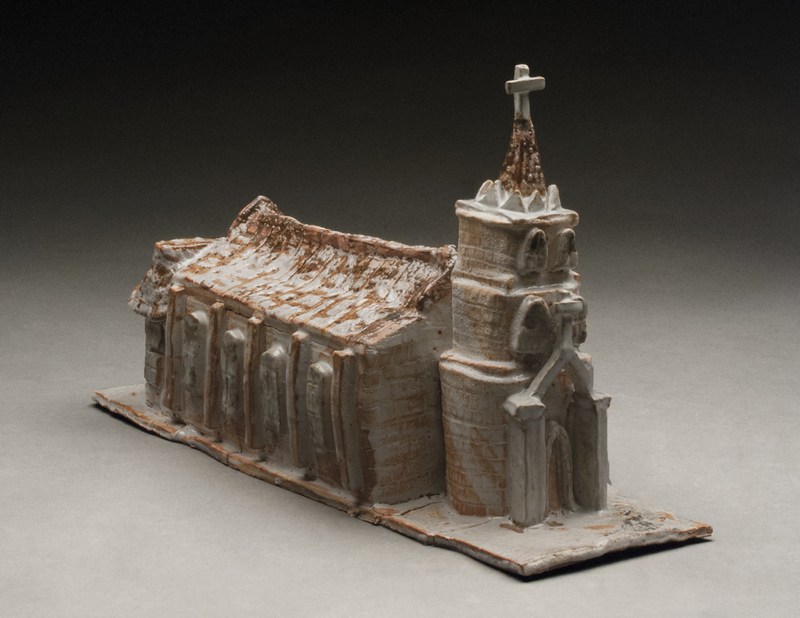 Hand-built and carved white earthenware with clear glaze and underglaze decorations. Students are asked to bring in at least five small, interesting objects from home. Objects must be approximately the size of a tennis ball or smaller. After choosing one object to use, students must scale up that object via handbuilding techniques. Scaled-up clay object must be at least one foot in its smallest dimension. 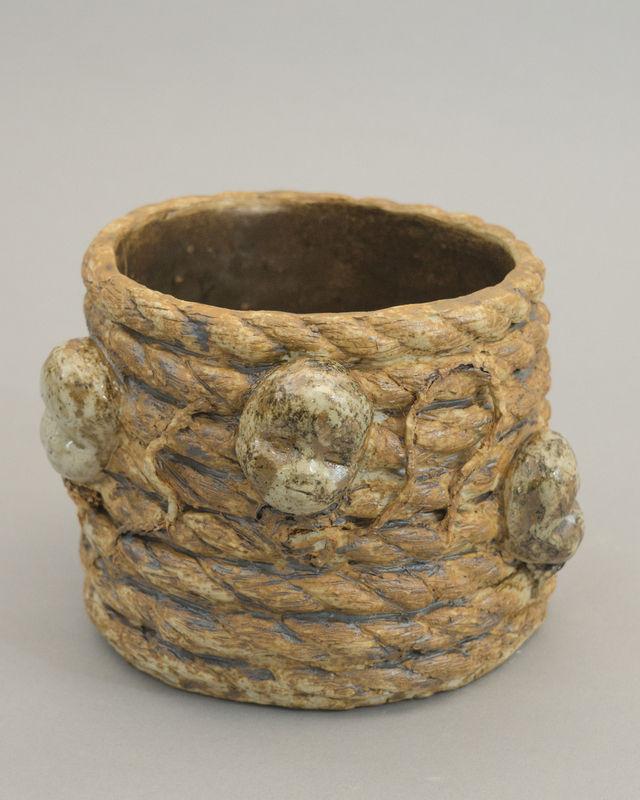 Surfacing and decoration must tell a linear narrative or story about the original object and its history. Cone 04 oxidation. 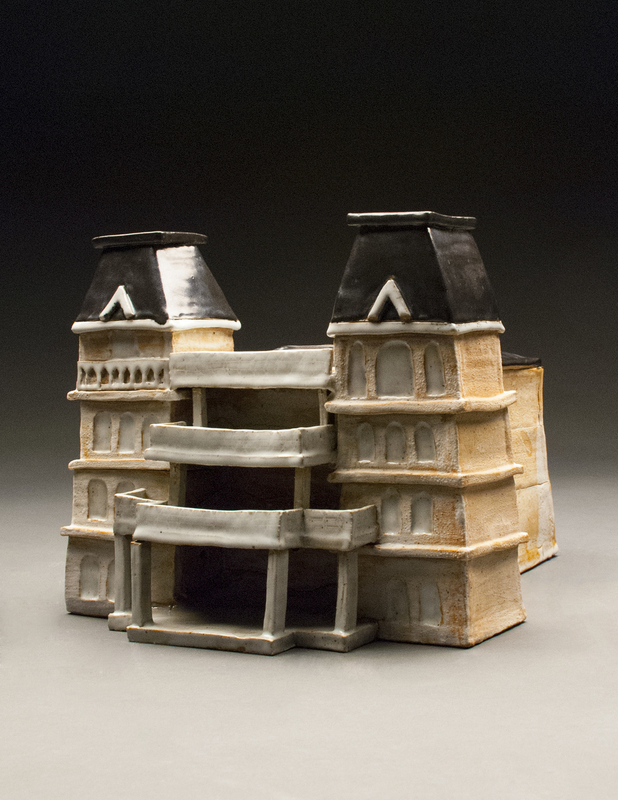 Slip-cast white earthenware with Lisa Orr clear glaze. Using a large collection of old commercial hobby molds, students must create a self portrait using only slip-cast components. Students are tasked with using cast pieces as building blocks, and are encouraged to use cast pieces in new and unconventional ways. Texture and 3D composition are discussed and students must defend techniques and conceptual decisions in crit. Cone 04 oxidation. Slip-cast white & stain tinted earthenware with clear and stain-tinted glaze and underglaze decorations. Using only pen & ink, students must create a final self-portrait using the techniques learned in the 2-week section on value. In addition to using techniques learned to create value, the student’s portraits must also reveal to the viewer secret that is unknown or hidden. Students must choose only one mark-making method: stippling, hatching, crosshatching, etc. In a field trip to the University Arts Library, students must find photographic portraits that display good range of values. Students must reduce the value into ‘zones’ of 3, 5, and 9 distinct shapes in 3 adjacent images. Using only one mark-making method for each image, students must render value differences in an ink + board triptych. Each value/shape grouping must use only one type of mark, but each image in the grouping must use a separate mark from the other two. 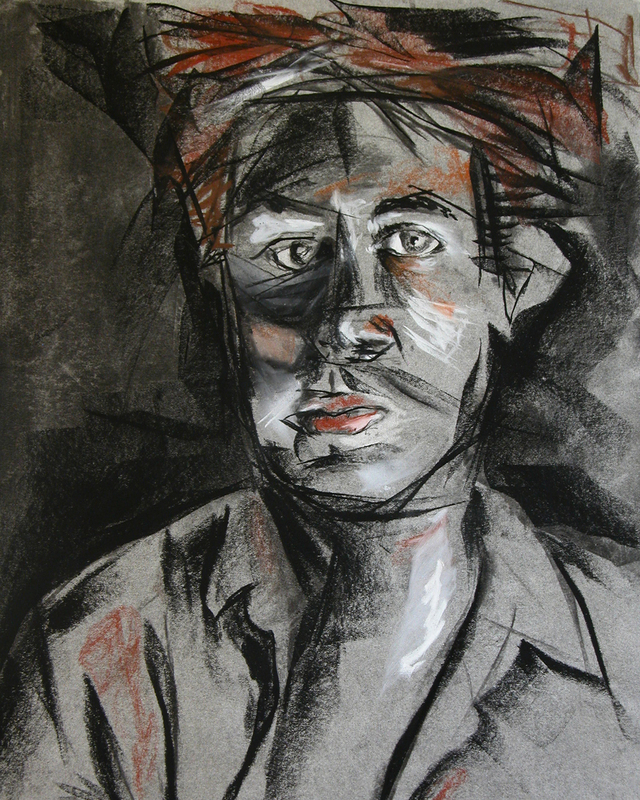 Students must create a self-portrait under increasingly shortened time periods. Students start with a 45-minute study, and work their way down to a full-page portrait done in 15 seconds. Students must render form and shape the body on paper using only a continuous circular hand motion. No angles or straight lines are allowed. Chewed gum, mini trash can, Mylar. Students are asked to bring in an object at least 8 inches in its smallest dimension. Students are then tasked with forming a protective layer over the object using a material that is in polar opposite to the purpose or concept of their original object. In critique, students must defend their choice of object vs. material and their craftsmanship.